If you love pizza just as much as you love the herb, then feast your eyes on these ten products that offer the best of both worlds. Pot and pizza are two of life’s greatest treasures. In fact, they are practically a match made in heaven. After toking on your favorite strain, nothing beats devouring a slice of cheesy, delicious pizza. But did you know that you can combine your love for both with one single product? Indeed, It’s true. 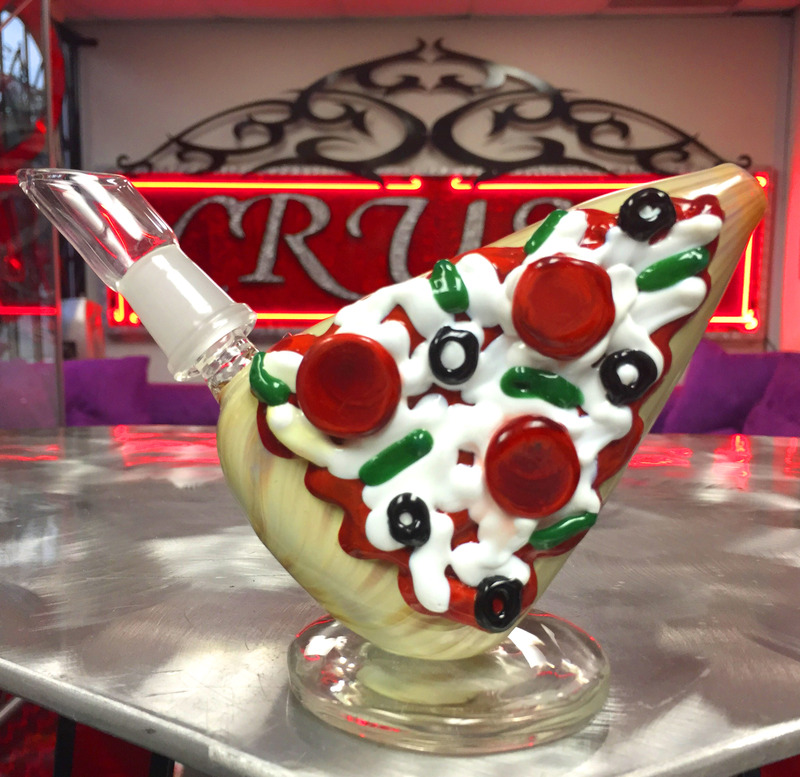 There are several pot products out there that are both weed and pizza-friendly. If you love pizza just as much as you love the herb, then feast your eyes on these ten products that offer the best of both worlds. Why store your buds in anything other than a stash jar with a slice of pizza on it? In fact, this rustic little pot is homemade. 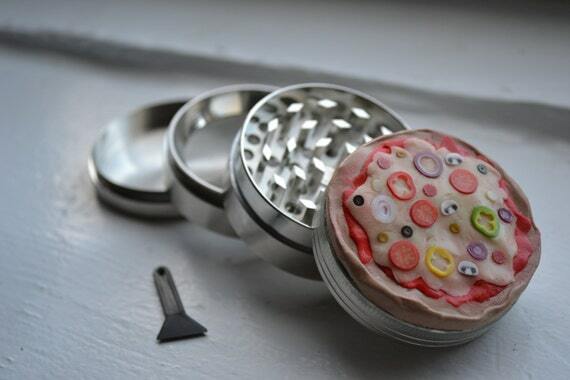 Not only does this grinder feature your beloved pizza, but it’s also glow-in-the-dark. Also, each one is custom made. In other words, your pizza grinder won’t look like anyone else’s. It’s a bit on the pricey side, but worth every penny spent. According to Etsy, this pipe is for tobacco use only. But let’s be real, you know what you’ll really be putting in there, and it’s certainly not tobacco. Bet you would love to take a dab out of this, literally. This rig is made strong and is also heat resistant. If you must have one, then head on over to The Crush’s website. Of course, you need something to light your weed. 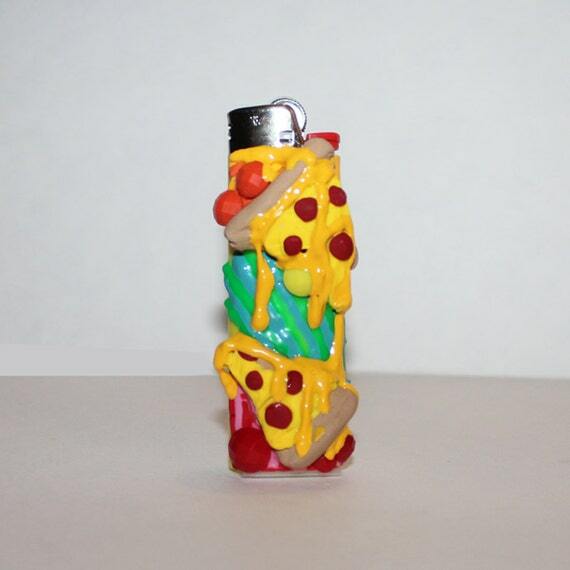 So, why not spark your pot with this awesome pizza lighter? 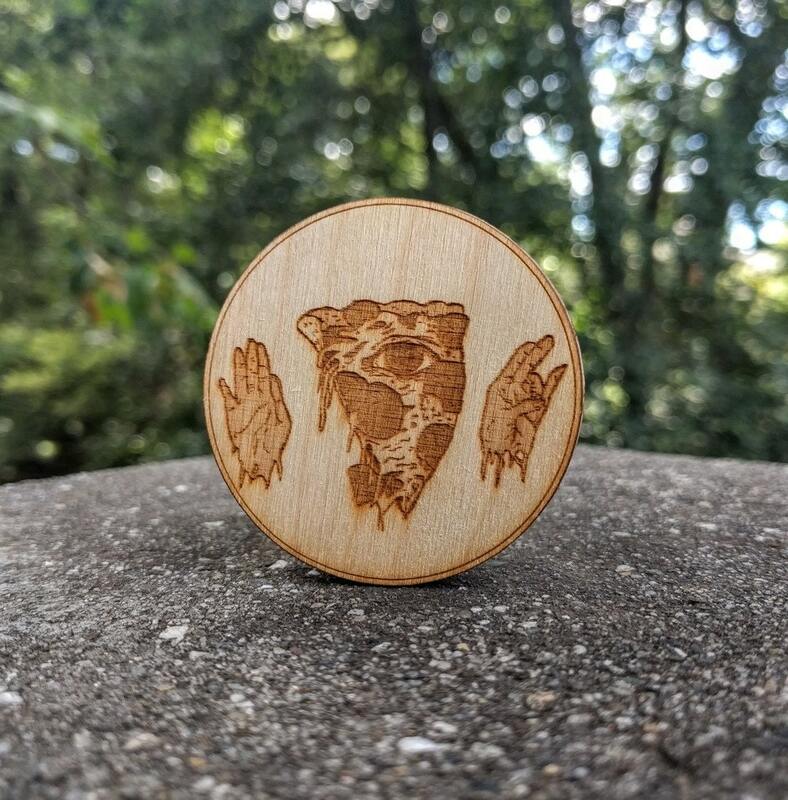 In fact, if you head on over to Etsy and purchase one, then you’ll get a free gift along with it. Cha-ching! After all, all you need is weed and pizza. You also need this shirt, though. 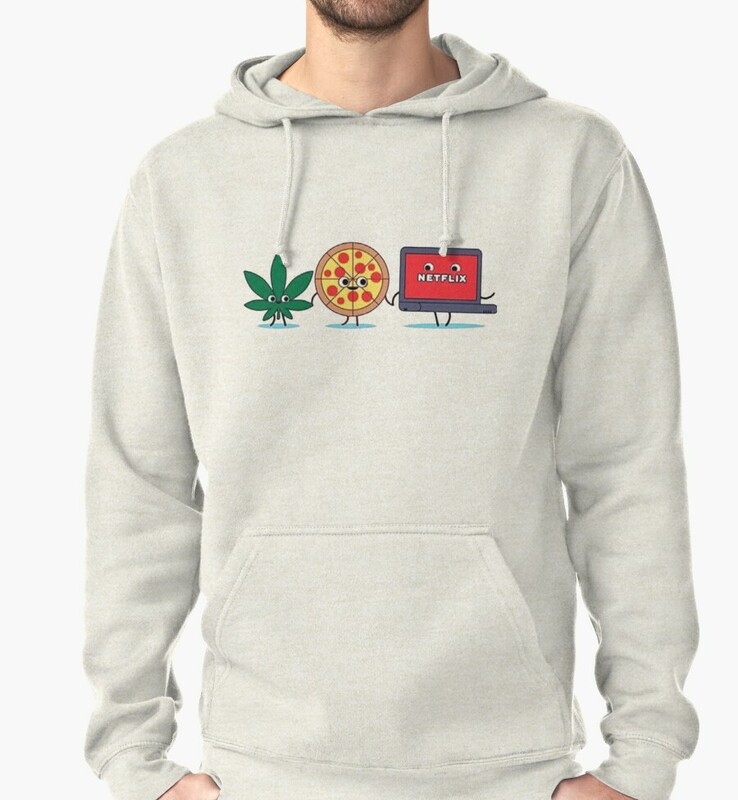 This hoodie doesn’t just feature pizza and weed but also Netflix. And everyone knows that those three things together equals pure bliss. Get you one here. You know you want it. 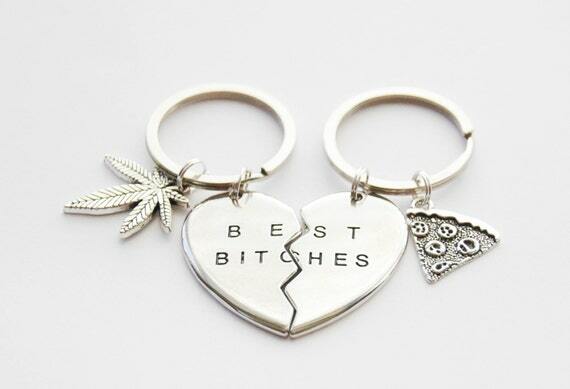 That’s right; best friends keychains are still a thing. 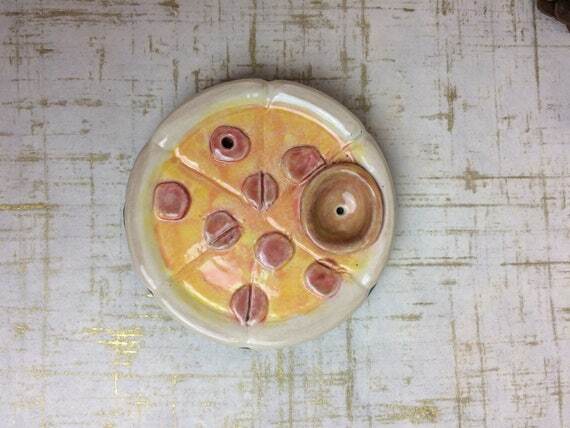 If you want to show your best pal some love, then gift them with this keychain that features both weed and pizza. Goodluck deciding which part to give them, though. Again, Netflix is included in this one. 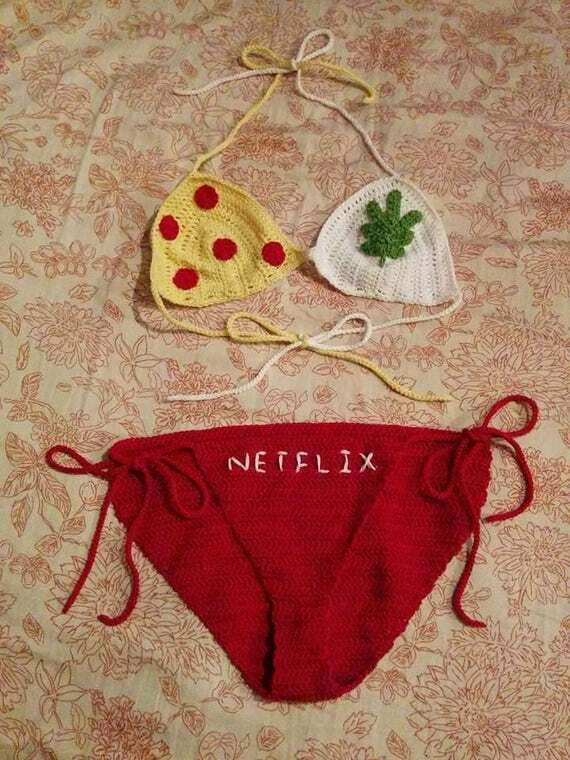 But how can you resist this handmade bikini? Summer is right around the corner, so now is the perfect time to snag one. Do you have a collection of stuffed animals? Or, do you have a furbaby at home that loves them? 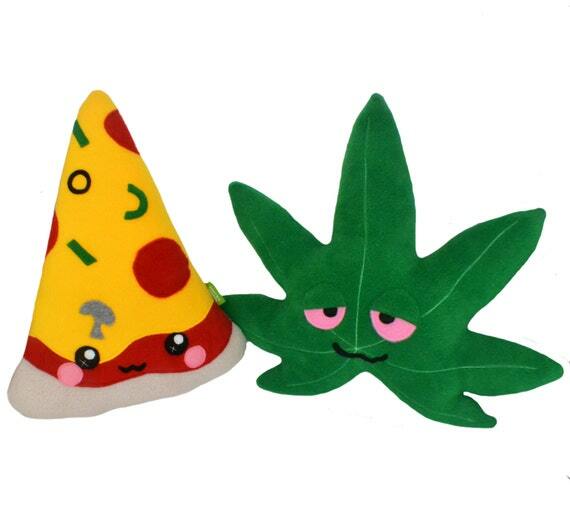 If so, then you must purchase these adorable pizza and pot plusheez.